Cool Audio Editor is a full-featured and powerful program for editing audio files. It is developed by FlyWing Inc. Audio editor: as an audio editor, Cool Audio Editor enables to edit the content of an audio file. 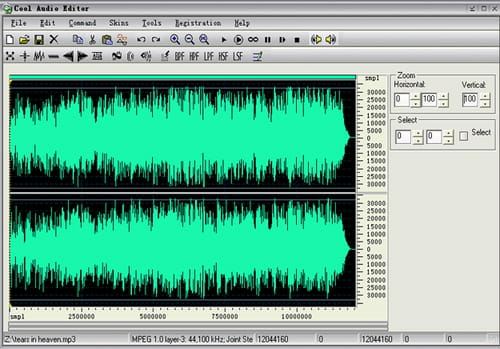 Among others, this program can cut, copy/paste or delete a part of the audio. At the same time, it is also possible to add filters (flanger, vibrato, stretch, resample, etc.). Converter: another option of Cool Audio Editor gives users the ability to convert audio files into other formats. It supports several audio formats including MP2, MP3, VOX, Audio CD, Ogg Vorbis and others. Voice reduction: this feature can reduce vocals on an audio file. This means that human voices are reduced to a very low volume (almost removed from the audio) and leaving only the instruments. It can be helpful to create a karaoke from a favorite track. Miscellaneous: apart from these features, Cool Audio Editor can be used to mix audio sounds, merge two files into one. It is integrated with a simple audio player so as to let users listen to the sound before and after edition. The interface is intuitive with customizable skin. Latest update on November 20, 2016 at 05:37 PM.